Lina Kostenko was born several days after the newspaper Pravda carried Stalin’s article “Dizzy with Success.” This happened on March 19, 1930, in the village of Rzhyshchiv, situated on the banks of the eternal river. Many years later Kostenko said that Rzhyshchiv once reminded her of Macondo from Gabriel Garcia Marquez’s novel One Hundred Years of Solitude. The Nobel Prize-winning Columbian author described Macondo as “a small settlement with two dozen huts built of clay and bamboo on the banks of a river that carried its transparent waters over a stone bed of white polished boulders the size of prehistoric eggs.” Macondo is inhabited by odd people, who time and again find themselves afflicted by strange maladies. In their world reality merges with fantasy and fable. What was Lina Kostenko’s fable of Rzhyshchiv like? Many Kostenkos lived there. One corner of the village was even called ‘Kostenkivshchyna’ or the land of the Kostenkos. I think that Kostenko, much like Akhmatova, who spent her childhood near Chersonese, could call her childhood pagan. After all, her childhood years also passed in a prehistoric setting. The surrounding nature here is primeval, giving the impression that people have lived here forever. It is easy to understand them. They are drawn to the river and everything that comes with it. The hills along the Dnipro provide protection against enemies. Archeologists have unearthed the remains of three Neolithic settlements near Rzhyshchiv. This means that in the 9th-8th centuries B.C. this was the site of a “cultural revolution”: nomadic tribes started to adopt a settled way of life, building dwellings, tilling the soil, planting barley, lentils, and peas, domesticating goats and sheep, and fashioning crafts. The Dnipro nourished the Neolithic people, who nestled by its banks. 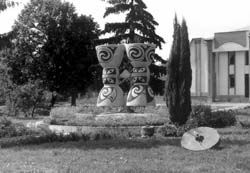 In the 1930s the Dniprovians had many things in common with the Trypillian culture, for example, dwellings. The walls of Trypillian houses consisted of wooden poles bound with vines and plastered with a mixture of clay and hay. The dwellings had centrally located stoves with smokestacks. This is very much how the peasants of Rzhyshchiv designed their houses, not to mention the clay kitchenware decorated with spiral ornaments, and female figurines that prove that art in the copper age was matriarchal in nature. The Trypillian culture flourished when the Egyptians were building their pyramids, and the first settlements started to appear in Troy. Meanwhile, it may have seemed to the natives of Rzhyshchiv that nothing had changed over the millennia. In her poetry Kostenko likes to bring together epochs paradoxically, as if the antiquity of the dim and distant past is close by — no farther than an outstretched arm. Rzhyshchiv witnessed many centuries of human history. Burials from pre-Scythian times and artifacts of the Cherniakhiv culture have been unearthed in the vicinity. In the Kyivan Rus’ period a fortified town called Ivan-Horod stood on the nearby Ivan-Hora Mountain, which is mentioned in a chronicle from 1151. Among the archeological finds is a lead signet with which princes and boyars sealed documents. I was unable to see that ancient signet. I hope it is now a highlight in some museum exhibit devoted to the Kyivan Rus’ period. Ivan-Hora cannot be confined to a museum, however. Here you can wander to your heart’s content, admiring the Dnipro vistas. Here you can come across the remnants of an earthen rampart and a deep moat that circled the town. With an effort of the imagination you can feel like a Ruthenian for a brief while. Perhaps the artist Ivan-Valentyn Zadorozhny, also a native of Rzhyshchiv, did just that when he was painting the faces of ancient Ruthenians, which are a common feature of his canvases. Some of Zadorozhny’s works are on display at this artist’s museum in Rzhyshchiv — a very humble museum that endures thanks to the enthusiasm of one person, the usual case. Construction of a history museum began a few years ago on the approaches to Ivan- Hora, but the resources did not last long. The construction project was frozen. Not far from Ivan-Hora is a place known locally as “Monastyrok” [Little Nunnery]. While the name is ancient, the nunnery was reestablished there only in post-atheist times. Kostenko once mentioned that the dacha of Nikolai Leskov’s sister was located somewhere around there. “If the Sylkins were alive, they would have told you where exactly,” say the residents of Rzhyshchiv. At one time the married schoolteachers N. and S. Sylkin did much to ensure that Rzhyshchiv had a biography of its own. In an essay about the town, which these ethnographers co- authored with V. Sheludchenko for Istoriia mist i sil Ukrainy [The History of Ukrainian Towns and Villages], I read that in 1240 Ivan-Horod was burned down by the Tatar- Mongols, repeating Kyiv’s fate. The first mention of Rzhyshchiv dates to 1506. At the time it belonged to the Kyivan metropolitans. Meanwhile, an entire historical novel can be written about Rzhyshchiv in the 17th century. The town revolted during the wave of peasant and Cossack uprisings led by Pavliuk, Hunia, Ostrianyn, and Skydan (incidentally, Pavliuk is one of the characters in Lina Kostenko’s poem “Duma pro brativ neazovskykh” [Ballad of the Non-Azov Brothers]). In Bohdan Khmelnytsky’s time a Cossack company of the Kaniv regiment was based in this town. Maksym Kryvonis’s detachments clashed here with the 6,000- strong army of Yarema Vyshnyvetsky, foiling his plans to cross over to the right bank and forcing him to retreat to Chernihiv. Under the Treaty of Andrusovo in 1667, Rzhyshchiv was ceded to Poland along with the right-bank Ukrainian lands, where it remained until 1793. When the Koliyivshchyna insurrection flared up, the town again demonstrated its rebellious character. In peacetime, like earlier, it mostly engaged in agriculture, cattle farming, fishing, and commerce. The local merchant community swelled with each passing year, especially after a wharf was built there, and industry started to grow (sugar plants and steel mills). The busy 19th century hurtled by and the 20th century arrived. The true history of Rzhyshchiv during the “Red century” has yet to be written. Historians have not written a chronicle of those incredible years, during which this town was intermittently controlled by Hetmanist forces, detachments led by Ataman Zeleny, the armies of General Denikin (whose remains were transported from France and recently re-interred in Russia in a solemn ceremony), and, finally, the Bolsheviks. Somebody must do this. After all, without “written words” (Kostenko), it is as though history never happened. While the cradle creaked in Vasyl Kostenko’s house, Rzhyshchiv was preparing for the “first Bolshevik spring.” The newly created collective farms, “First of May” and “Eighth of March,” had to manage 2,300 hectares of land. The yellowed pages of the Rzhyshchiv newspaper, Kolektyvna nyva [Collective Field], launched in 1930, radiate the atmosphere of an intensifying psychosis. It was primarily a psychosis of total collectivization and the “elimination of parasitism.” Orders were issued to fulfill the plans of the First Five-Year Plan within four years. Reanimation of the economy was to be implemented by the party’s iron hand, popular enthusiasm, socialist competition, and the shock-workers’ movement. Time and again “storm days” were announced and “redlists” and “blacklists” publicized. After some time a meeting of party cells in the Rzhyshchiv area congratulated the Central Committee of the All-Union Communist Party (Bolsheviks) on the appointment of “the best Bolshevik-Leninist, Comrade Molotov, as chairman of the Council of People’s Commissars of the USSR.” They also welcomed Rykov’s expulsion from the Politburo. In May 1931 public renunciations of parents were occurring on a mass scale, and entire families were sacrificed in the name of class interests. This is what the Macondo on the Dnipro was like. Would Marquez have enough imagination to picture anything like this? Perhaps not; this would require a George Orwell with his ability to expose the absurdity of an upside-down world. Life continued to flow, like the Dnipro — the daily life of the residents of “Kostenkivshchyna,” Rzhyshchiv, Ukraine, the USSR — life above the barriers. Lina Kostenko’s father was repressed in the 1930s. He is still remembered in Rzhyshchiv after all this time. He knew several languages. People say that he was writing a book, supposedly in German. Even if it’s a legend, there is some truth to it. That I am five years old, still a child. I like candy and am reading Brem. In the home of the schoolteacher Vasyl Kostenko in 1935 it was possible to read a book by A. Brem on animal life. 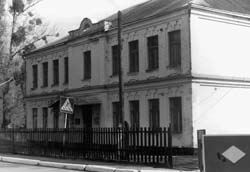 How many such homes were there in Rzhyshchiv at the time? As we can see, the six childhood years that Lina spent in Rzhyshchiv left some colorful “slides” in her memory. She remembered quite a lot, mainly the faces of her ancestors and family legends. In time they were brought to life in Kostenko’s poetical novellas “Veselyi pryvyd prababy” [Great-Grandmother’s Merry Specter], “Khramy” [Churches], “Liubliu lehendy nashoi rodyny” [I Love the Legends of Our Family], etc. Some colorful people lived in that Ukrainian Macondo. The great-grandmother was still youthful in her 110th year. At one time her beauty captivated a young man from a rich family with whom she eloped. She went on to “serve” 25 years of military service with her beloved husband who was punished “for his love” in this way by his father. The great- grandmother was “from the nobility.” She powdered her face. Even when she became blind, she still liked to comb her long hair, weaving it into a braid in front of a mirror. At such moments it seemed that she was stringing a harp. She would call her great- granddaughter over and ask her under her breath: “Look at me in the mirror. Is this comb becoming to me?” She was supposed to do just that: look at her in the mirror, i.e. look for her (“Great-Grandmother’s Merry Specter”). The following poetic “slide” features the portrait of her grandfather Mykhailo. He was a church builder: “a monk, a fighter against the devil, a hermit, a pious man.” He was a master obsessed with his construction, which was difficult but inspired labor. He was a sinless man, who never succumbed to temptation or vanity. Grandfather Mykhailo “did not divide his soul between God and the devil,” much like Kostenko’s famous character Marusia Churai. It is worth remembering that righteousness is arguably the most important trait in Kostenko’s moral catechism (“Churches”). She literally locked herself in the cellar. She turned white as a wall. As if possessed by Satan. All those who vexed her would disappear. The children and husband begged her through the air hole. But she kept silent, as if in a bastion. Victoriously defenseless in her great muteness. And there would be no more talk of this. (“I Love the Legends of Our Family”). 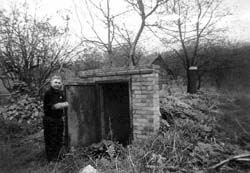 At Easter in 2005 I saw that cellar on the former premises of Vasyl Kostenko’s house. In fact, the cellar is all that remains; the house did not survive; it was leveled by a bulldozer. Concrete blocks rested nearby, waiting for the summer, when the plot’s new owner was supposed to start building his cottage. The cellar seemed to be eternal, like Ivan-Hora. During the war it saved the entire neighborhood from German bombs. Built to last, with a rounded brick dome, it was spacious and dry, providing shelter to the people of Rzhyshchiv, much like it once hid the proud grandmother. That cellar does not know that it has been immortalized in literature. Childhood memories come to life in many poems by Lina Kostenko. Her 1987 collection entitled Sad netanuchykh skulptur [The Garden of Unmelting Sculptures] includes an entire chapter made up of poems filled with bright sadness, fairy-tale images, fanciful and colorful play of the imagination. This chapter is entitled “Nevydymi prychaly” [Invisible Wharves], a metaphor from her distant pagan childhood. You don’t believe me? Resting the green mane of the long-leaved violet willow on their claws. A pirogue has moored on the sand. Somebody is cooking fish soup, thick smoke is everywhere. A dry, cracked road crawls like a thirsty crocodile. Kupava is bathing in the Dnipro. From behind the Trypillian mountain. And behind Chernihiv there is Chernih. Chernih is fearsome, very black. Chernih gets into a black boat and casts black fishing nets. green curls of the pine. Are but invisible piers in the Dnipro’s deep memory. This is an elegy in which happiness is mixed with sorrow, and lyrical feelings are accompanied by reflections on the unstoppable flow of existence. But there is also so much light that remains on the other side of the mountain in Rzhyshchiv. — Why this strange prison game? All this is still ahead: a whole 30 years have yet to pass from the sweet days of reading Brem. Lina Kostenko never visits Rzhyshchiv. 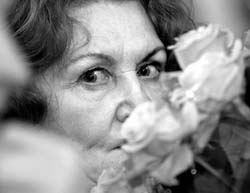 The last time, she saw the town of her childhood from a distance, when she was being driven by Yevhen Popovych, the translator of Doctor Faust, her neighbor and friend. Her Rzhyshchiv from the distant past is no longer there. It has long been in the flooded spring fields of memory.